The ball that former Toronto Blue Jays slugger Jose Bautista launched into the stands before his legendary bat flip is up for auction. It's believed to be the most significant Blue Jays-related game ball ever put up for sale. A piece of Toronto Blue Jays history is up for auction -- and the owners hope it stays in Canada. The ball from Jose Bautista's three-run homer in Toronto's wild 6-3 victory over the Texas Rangers in Game 5 of the 2015 American League Division Series was put up for auction on Friday, with bidding open until Feb. 1. 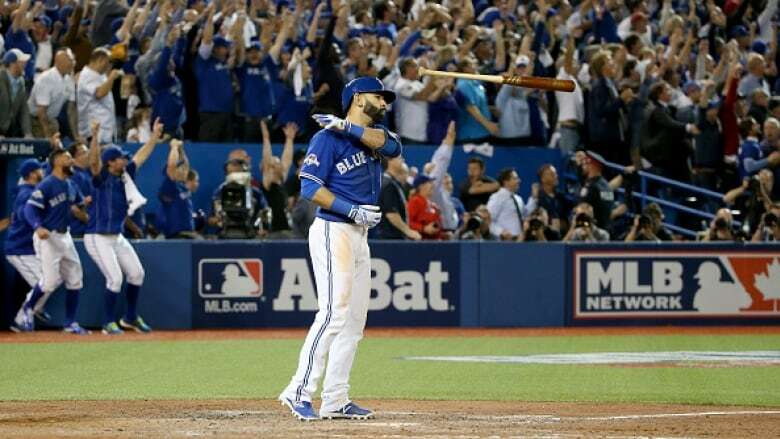 The seventh-inning shot won the series for Toronto and became entrenched in Blue Jays lore when it was punctuated by Bautista's notorious bat flip. "People want to see the ball and the fact that no one's ever seen it, really, it sort of gives it a sense of mystery," said the consignor, who asked to remain anonymous. "It's time for people to appreciate it, especially toward the end of Bautista's career. What better way to celebrate his career as a Jay?" The now famous bat is kept in a glass case in Toronto's clubhouse in a foyer between the manager's office and the player's locker room. A team spokesman says the bat will be on display for fans to see at the Blue Jays WinterFest Jan. 19 and 20 at Rogers Centre. The ball's location, however, has largely remained a mystery until now. "I was in a bar in Guelph, Ont., with my buddies who are all big Jays fans and we were arguing about what the greatest moments in Jays history are," said the consignor, who has a large collection of sports memorabilia. "The waitress comes out and says 'are you guys talking about that home run where the guy flipped the bat?' and I said 'yeah' and she said 'I know the guy who caught the ball. He's my friend's boyfriend.' So I got his contact information and started to negotiate." Jeff Byma, a Cambridge, Ont., native, caught Bautista's ball and, after offering it to the Blue Jays slugger, decided to keep it. After two years of negotiation Byma sold it to the private collector, who owned it for a year before putting it up for sale through Lelands, an online auction house that specializes in sports collectibles. The reserve bid is US$3,500. "This is not the way these things go down," said Joshua Evans, chairman and founding partner of Lelands. "The idea of this guy selling it in a bar it's very retro, it's a real throwback, because that's the way things were done like 30 years ago, or even more." In addition to Bautista's ball, Lelands had put up for auction a Joe DiMaggio game-worn New York Yankees uniform from 1950 and 1951 and a Bobby Orr hockey card from 1966 that the auction house believes is the world's most valuable hockey card. Other significant home runs in Blue Jays history, like Robbie Alomar's from the 1992 ALCS, Joe Carter's walk-off winner in the 1993 World Series, and Ed Sprague's in the 1992 World Series, are all owned by the players who hit the respective homer. "Of all the five or six iconic baseballs in Blue Jays history this is the only one that's ever going to be for sale. The other guys like Sprague and Alomar and Carter are going to keep them, they're going to give it to their kids," said the consignor. "This is a great opportunity to own the best piece of history for the Blue Jays in the past 20 years, by far. We want someone local to buy it, a business to put it on display." Bautista is currently a free agent after leaving Toronto in 2017 and playing for the Atlanta Braves, New York Mets and Philadelphia Phillies in 2018. His 288 home runs are second all-time in Blue Jays franchise history behind Carlos Delgado's 336.